https://www.kipling-usa.com/disney%27s-90-years-of-mickey-mouse-art--handbag/100274224.html Art Disney's 90 Years of Mickey Mouse Handbag Oh boy! We're excited to celebrate 90 Years of Mickey Mouse with our newest Disney Collection. The Art handbag is one of our favorite bags for every day and simply being on-the-go. Its spacious interior, cool design, and handy pockets make it a versatile style that can be used as a gym bag, beach bag, work tote, weekender, and everyday handbag. Plus, Art is equipped with exposed zippers at the corners so you can change up the silhouette to match your style. Dimensions: 14"L x 7.75"H x 11.75"D 8" ; Drop Handle: 8"
Oh boy! We're excited to celebrate 90 Years of Mickey Mouse with our newest Disney Collection. The Art handbag is one of our favorite bags for every day and simply being on-the-go. 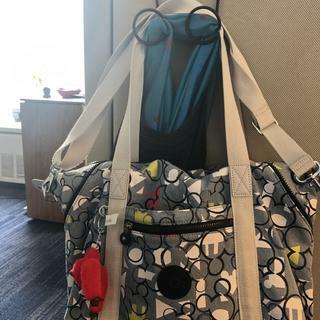 Its spacious interior, cool design, and handy pockets make it a versatile style that can be used as a gym bag, beach bag, work tote, weekender, and everyday handbag. Plus, Art is equipped with exposed zippers at the corners so you can change up the silhouette to match your style. This bag is very nice and well made. I didn't realize that it was on the larger size. Love everything about this bag. Received lots of compliments it is a conversation piece. Excellent quality well done. It's an every day bag. Thanks! Purchased this bag at Disney Springs and love it. I can carry my essentials for everyday and also can add my 13 inch labtop. The front pocket is perfect for cell phone. Bag is light weight too! I have bought 3 of this bag. It is great for travel. It’s light weight and has plenty of pockets. I highly recomend it. HUGE DISNEY FAN FOR LIFE!!! BEST ANSWER: This bag is a tote with removable and adjustable strap that will allow you to where it across your body. I loved. I love Kipling are my favorites I would like to have the entire collection of Mickey. Not in my opinion. It’s too large.